Grace of Spades makes sure the levels are correct as Phast Phreddie the Boogaloo Omnibus cues a record for the “Watch This Sound” show. 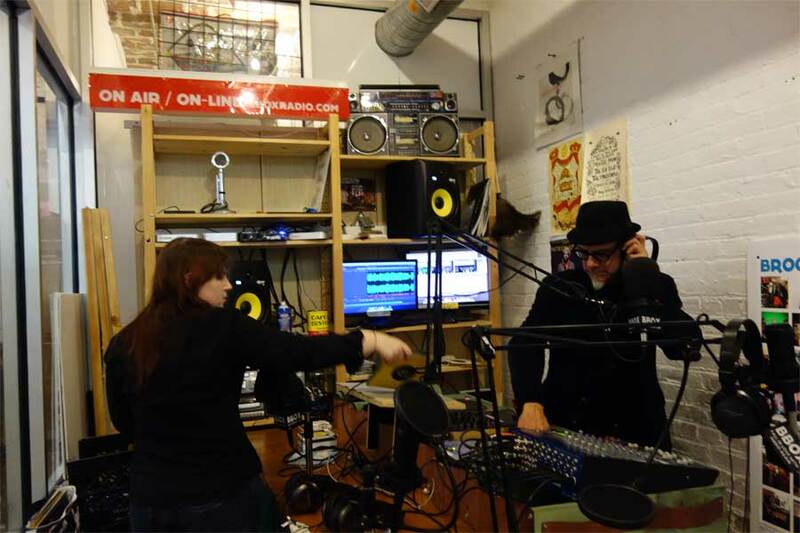 Our friend Grace of Spades hosts a groovy radio show on bbox.com, a Brooklyn community radio station that goes out over the interwebs. Her show is called Watch This Sound, and it takes place every Tuesday from 8 to 10 pm. On her show, she features lots of reggae records, but also quite a bit of soul and funk. Due to a sort of convergence of the birthdays of two great soul singers, Etta James (January 25) and Sam Cooke (January 22), she decided to feature these two great artists on her program that was aired on Tuesday January 20 (which just happened to also be the anniversary of Ms. James’ death three years ago). Miss G figured it would be nice to have an oldster on the show, in order to play a couple Sam and Etta tracks and/or stuff related to them, and possibly drop some science in the course of the program. For this she turned to Phast Phreddie the Boogaloo Omnibus. Grace started the show with a cool selection of Sam Cooke and Etta James records, along with a whole bunch of reggae covers of Sam Cooke songs, most of them by the great Ken Parker. After an hour of this, Grace played Sam Cooke’s original version of “Twistin’ the Night Away,” and then asked The Boog to take over. 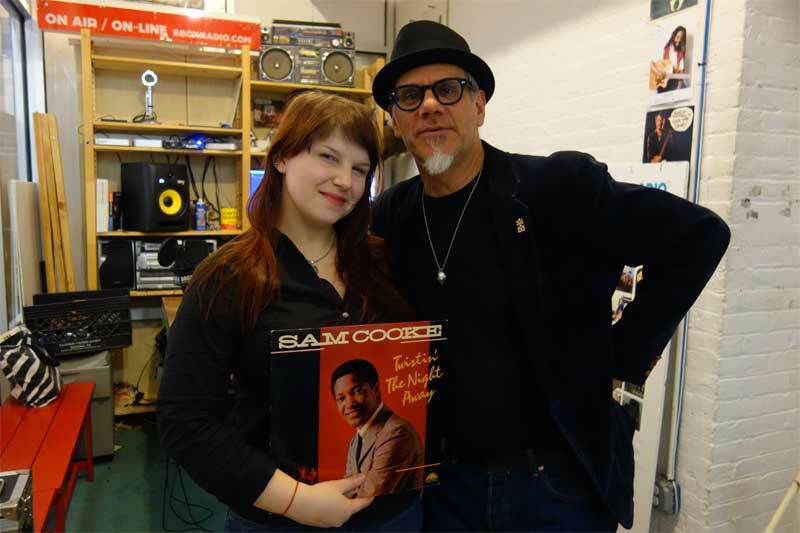 Grace of Spades and Phast Phreddie the Boogaloo Omnibus swing with Sam Cooke at “Watch This Sound” radio show. Then, Etta James records wrecked the place; she has such a tough voice! Sure, Ms. James had the ability sing a ballad as well as anybody, and Miss Grace played several in the first hour, but what was heard on this show was a handful of screamers before time ran out. Just before the automated bbox comput-o-thig-a-ma-jig clicked over to the next show, The Boog was able to sneak in most of another reggae version of a Sam Cooke song. Dig the show by listening to it on the Bbox Radio Archive here!! 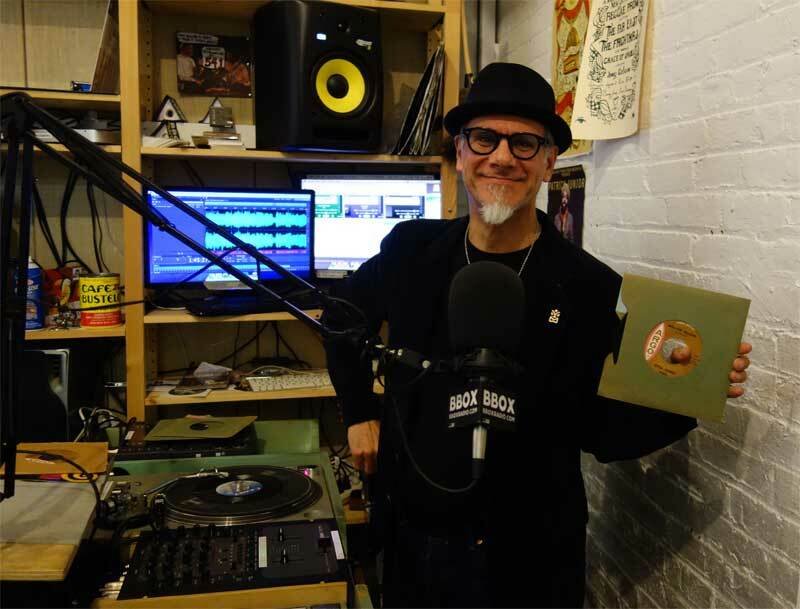 The Boog displays a great Etta James record on “Watch This Sound” radio show. This entry was tagged Boogaloo Omnibus, Brooklyn community radio, Etta James, Grace of Spades, Phast Phreddie, radio, reggae, Sam Cooke, soul music. Bookmark the permalink.